Crawl-thulhu: A Two-Fisted Zine of Lovecraftian Horror Issue 1 was written by John Potts and illustrated by Todd McGowan. The publisher is Discerning Dhole Productions. This is the first issue of a zine seeking to combine the Lovecraftian Mythos and two-fisted pulp action in a 1920s milieu...which means that you might even survive with most of your sanity intact! Not that you should count on it in this issue, wherein you create 0-level characters and go through a funnel adventure. Pulp Action in the 1920s: Because this zine is focused on Dungeon Crawl Classics-based play, your PCs may survive. Luck is for the Sane: You have Sanity instead of Luck. After 0-level, there are ways to restore Sanity. When you run into Mythos creatures, or catch glimpses of the true nature of the world, you make a Sanity Check and might go insane. Going insane doesn't end the game for you, though, except in extreme cases. When you fail a Sanity Check, you roll an Insanity Die of various sizes to determine what happens to you. Firearms: It's the 1920s. They have guns. You can have guns, too. Fight Against Impossible Odds: This is a section on how to create 0-level characters for the Crawl-thulhu setting. There is a section on Common Names in the 1920s, which adds to the flavor of the game, Occupations, and Celestial Alignment. Celestial Alignment replaces a normal DCC character's Lucky Sign, and can not only modify certain preset rolls, but results in a +1d Action Die shift on rolls against creatures related to the indicated planet/star regardless of your actual Sanity. Otherwise, the modifiers are based on your current, not your initial, Sanity. 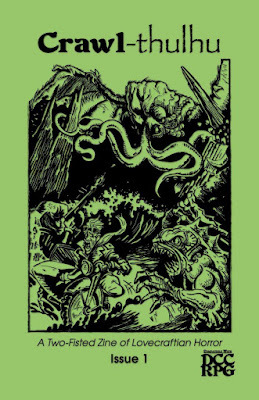 A Horrible Day at the Dunwich Fair: What is a new Dungeon Crawl Classics milieu without a funnel adventure to start you off in? This adventure is an adaptation of H.P. Lovecraft's The Dunwich Horror (which the judge should read), and sees the titular creature rampage across Dunwich. Commune with Yog-Sothoth: The first spell that the PCs come across, and it reveals how casting will work in the Crawl-thulhu milieu. Casting it requires a Sanity test (check), as one might expect. A natural "1" causes you to lose the spell and your mind (all Sanity). Failure causes Sanity loss, and the spell is lost for a whole month rather than for a single day. The Insanity Die size is the Crawl-thulhu version of spell level. Next Issue: Slated to contain six classes, skills, magic, and information for setting up Crawl-thulhu campaigns. That's pretty ambitious for a second issue, and I would not be surprised if part of that appears in a third (or even a fourth!) issue instead. A Crawl-thulhu character sheet is also provided. Okay, with that out of the way, let's talk about this product in relationship to existing Dungeon Crawl Classics materials. Could you run a Crawl-thulhu scenario using Transylvanian Adventures, Dark Trails, or Black Powder, Black Magic as an engine? Every indication suggests that you can. You could even mix and match the rules you prefer. The funnel, A Horrible Day at the Dunwich Fair, has a lot in common with The Arwich Grinder, which is also based heavily on H.P. Lovecraft's work. You could easily run the funnels together as part of a larger scenario, if you liked, either converting the Crawl-thulhu materials to standard Dungeon Crawl Classics or vice versa. There are quite a few other Lovecraftian resources for Dungeon Crawl Classics that might be usable with Crawl-thulhu. Probably the most apropos of these are Lovercraftian Monsters for Dungeon Crawl Classics and The Thing That Should Not Be, both by Jon Hook, and both in the Goodman Games Gen Con 2017 Program Book. Welcome to Crawl-thulhu, where you will scour quaint, corrupt towns and forgotten catacomb for cults and monsters bent on the downfall of humanity; sacrifice your sanity to cast reality-bending spells that your mind was never meant to know; travel to strange, alien dimensions and planets; and put your body, mind, and very soul on the line to keep the Great Old Ones’ plans on hold so mankind can live another day. 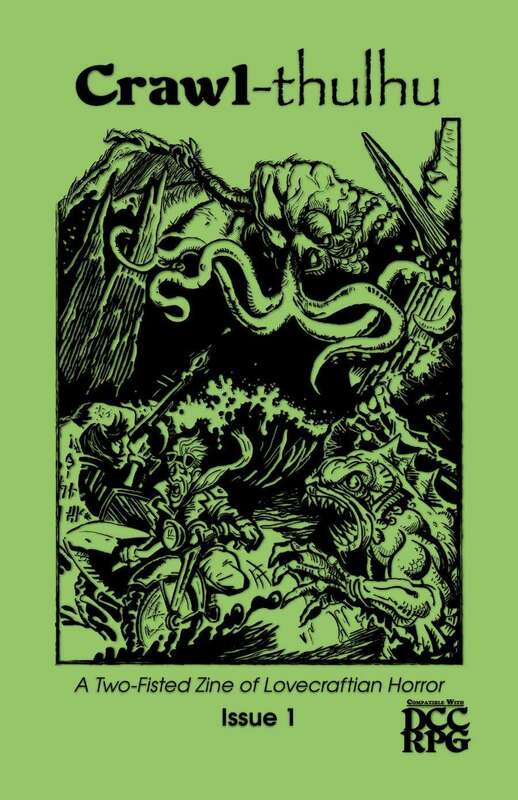 Crawl-thulhu requires ownership of the Dungeon Crawl Classics rulebook.